Executive summary: Jazz trombonist, Turn Me Loose! Played with Stan Kenton's orchestra from 1952 to 1954. 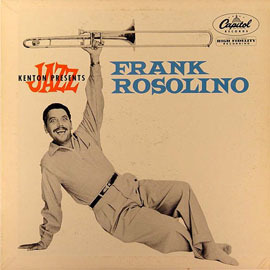 Though best known for his work in big bands, Rosolino also released a handful of solo albums, showcasing his trombone technique and his inimitably nasal voice. After learning that Rosolino had been carrying on an affair, his third wife committed suicide via carbon monoxide in their garage. Rosolino was unable to cope with her death, so one night in late November he shot both of his young sons, killing one and blinding the other, before killing himself.